Evelin Ilves, Spouse of the President of the Republic of Estonia, met Zsuzsanna Jakab, WHO Regional Director for Europe on 27 February 2014 to discuss her role as Champion of Health in the WHO European Region. 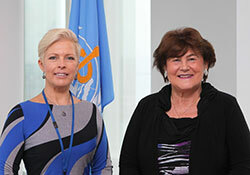 Visiting WHO/Europe on 27 February 2014, Mrs Evelin Ilves, spouse of the President of Estonia, accepted the invitation of Ms Zsuzsanna Jakab, WHO Regional Director for Europe, to become the Champion of Health for Noncommunicable Diseases (NCDs) in the WHO European Region. With her training as a doctor, Mrs Ilves has a strong interest in health and a personal commitment to support the fight against NCDs. She has already made her mark in Estonia by advocating food reformulation, healthier school food and the use of local products. At a meeting with WHO technical experts, discussion focused on how Mrs Ilves could best support WHO/Europe’s work on NCDs within the framework of Health 2020, the European policy for health and well-being, through her commitment to public health. Through her advocacy, the First Lady will specifically support promoting breastfeeding, reducing childhood obesity and strengthening regulation on marketing to children. These are important issues in Estonia, as well as on the international scene. Breastfeeding rates are stalling in the WHO European Region, while Estonia sets a good example for others to follow. The prevalence of childhood obesity is increasing in Estonia, as in the Region as a whole. With Mrs Ilves as Champion of Health, WHO/Europe has gained an advocate who is passionate about making a difference to the future of the Region’s children and highlighting the serious public health concerns facing Europe.